Organic heirloom cherry tomatoes will become your favorite summer food with these delicious summer recipes! Summer’s not over yet! But the best thing about the end of summer is the heirloom tomatoes. Heirloom tomatoes of all varieties are delicious in August, but organic heirloom cherry tomatoes have the perfect amount of sweetness and acidity for any summer recipe. 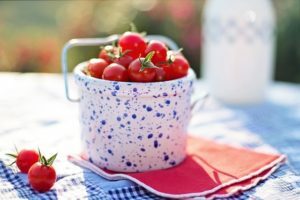 Organic heirloom cherry tomatoes will become your favorite summer food with these delicious summer recipes! Maryland is known for having some of the best produce on the East Coast. Maryland tomatoes and Maryland corn are good all year long, but they are at their peak in August. With this sweet Maryland corn and heirloom cherry tomato pasta, everyone will enjoy the rest of the summer. With some al-dente bowtie pasta and fresh, organic basil, this will be a summer staple for years to come. If you’re looking for a way to incorporate heirloom cherry tomatoes into an appetizer for a summer dinner party, this heirloom cherry tomato-Greek yogurt dip is the perfect fix. Every guest will ask you for the recipe for this fresh and light hors d’oeuvre. All you need is a cup of cherry tomatoes, plain Greek yogurt, extra virgin olive oil, crushed red pepper, and organic fresh basil. Don’t forget the pita bread, baguette, focaccia, or cucumbers for dipping. We’ve mentioned the popularity of burrata before, and we can’t get enough. This cheese is so good that you’ll want to find ways to eat it for every meal! For this burrata dish, you’ll first need to roast your organic heirloom cherry tomatoes for 20 minutes. Then grill some slices of focaccia over an oiled grill pan. Place the burrata in the center of a serving dish and place the tomatoes all over the burrata. Drizzle with balsamic glaze and place the grilled focaccia to the side of the dish. This easy recipe is so good, you’ll be making it for the rest of the summer! FRESH HEIRLOOM CHERRY TOMATOES FROM BAYWATER FARMS! You can find our fresh, non-GMO, sustainable heirloom cherry tomatoes in national grocery store chains, produce distribution companies, roadside farm stands, local farm-to-table restaurants, CSAs, and farmers’ markets. To learn more about ordering our fresh local produce, click here. This entry was posted on Friday, August 10th, 2018 at 3:50 pm. Both comments and pings are currently closed.